It seems everyone is talking about, and cooking, Quinoa these days, also known as “quinua” in Spanish. The name is derived from the Quechua Spanish word “Kinwa” or “Qin-wah” and originates from the Andean region of Peru, Ecuador, Bolivia and Colombia. I love quinoa because is a versatile ingredient that serves as an excellent base for a variety of healthy and satisfying meals. It is very easy and quick to prepare, and has a delicious nutty flavor with a light and fluffy texture. Quinoa comes in different colors, such as off-white, red and black quinoa, which all have similar flavor, texture and nutritional content. I love using quinoa to replace rice or other grains as a side dish, as a base for salads, to make meatless croquettes, stuffed peppers and as an addition to soups. Before you cook quinoa, it must be rinsed very well. I put quinoa in a fine mesh sieve and run it under water, moving it around with my fingers to remove the bitterness of the coating. 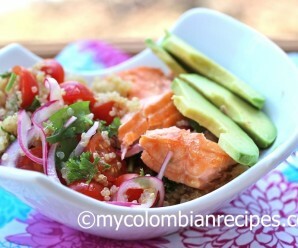 This Quinoa, Salmon and Avocado Salad has everything I like and it is good for me! Don’t let the health factor fool you, the combination of textures and flavors in this salad will make it a kitchen staple in no time. It covers all the bases as far as my taste buds are concerned. Nuttiness from the quinoa, spicy red onion slices, sweet grape tomatoes, creamy avocado, fresh cilantro, a little acidity from the vinaigrette, and rosy pink tender salmon.What’s not to love about this bright and beautiful salad? If you don’t like salmon, just replace it with some small pieces of cooked chicken, grilled shrimp, leftover steak or braised pork. If you don’t like the vegetables I used, you can replace the tomatoes and avocados with other vegetables. Everything is negotiable here, except the quinoa! To prepare the Quinoa: Place the quinoa, oil, salt and the water in a medium pot. Bring to a boil, reduce heat to low and let simmer for about 15 minutes or until the water has evaporated and quinoa is tender. Mix the tomatoes, scallions, red onion, white vinegar, cilantro, lime juice, olive oil, salt and pepper in a bowl. Add the cooked quinoa and mix well. 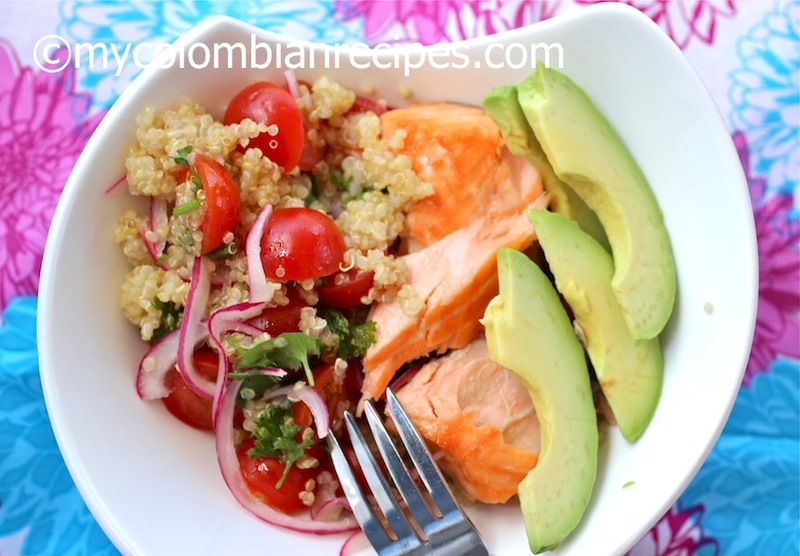 Place the quinoa salad in a bowl and top with the salmon and avocado slices. Serve immediately. 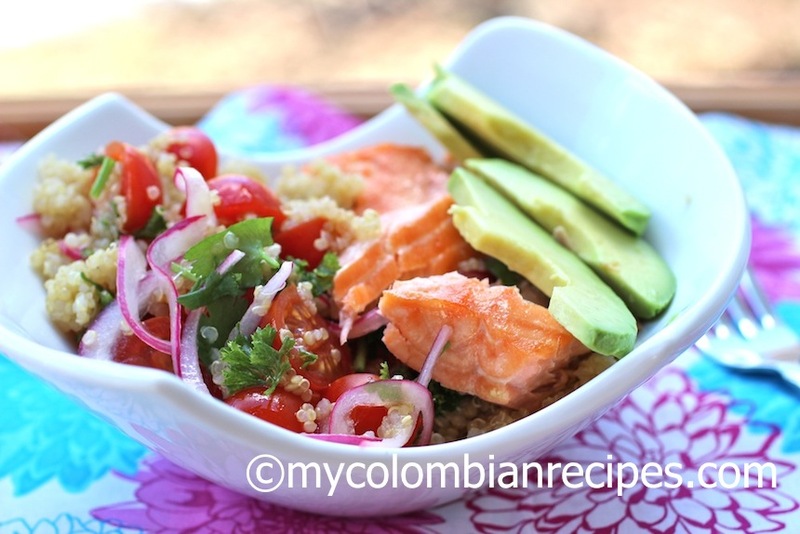 « My Colombian Recipes has Redecorated! Big fan of quinoa and I can see myself eating this a lot as a lighter dinner on the balcony for the summer. Totally love the new site look! Great, simple, healthy. 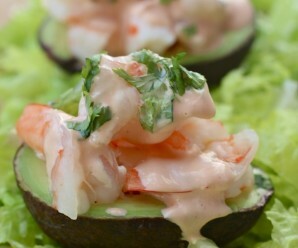 I am a huge fan of quino, so easy to make and so many ways to change it up! 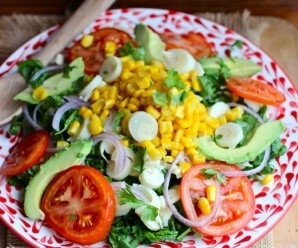 Your Salad has everything in it: Beauty, glamor, freshness, goodness, sunshine, warmth, life. Hmm, everything negotiable except the quinoa. 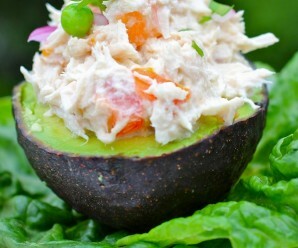 I picked out this recipe using Food Blog Search to use up some food on hand: leftover salmon and red rice, plus an avocado. So I made it just like your recipe- except the quinoa! Ironically I do make quinoa dinner salads pretty often. But your recipe was a smash with the red rice, too, the whole family agreed that it was something they would like to have again. Loved the lime in it especially, plus the scallion, tomato, cilantro– just a great combination of flavors. Thanks! This was so simple to make, but delicious flavours – thank you!